Nespresso PROThere are 5 products. Royal Café Ristretto capsules compatible with Nespresso ® PRO machines. Ristretto is the intense coffee by definition, its aromas are powerful and very well complemented by a fruity note, its intensity is 9/10. Box of 50 capsules. 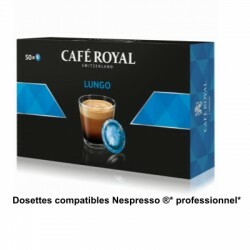 Royal Coffee Lungo pods compatible with Nespresso ® PRO machines. These Lungo pods have a balanced coffee with a sweet acidity accompanied by a sumptuous caramel. These Royal Coffee capsules are 100% Arabica. Box of 50 capsules. 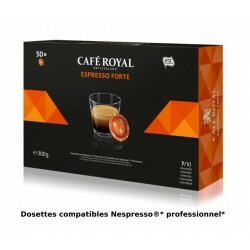 Royal Coffee Espresso Strong Capsules compatible with Nespresso ® PRO machines. Espresso Forte is a 100% arabica full-bodied coffee capsule. This coffee is accompanied by a note of dark chocolate and fruity aromas. Its intensity is 8/10. Box of 50 capsules. Lungo Forte Café Royal Capsules compatible with Nespresso ® Professional coffeemakers. Lungo Forte is a powerful 100% Arabica coffee. Its aromas are both intense and persistent, its intensity is 4/10. Ideal to start your day. Box of 50 pads. 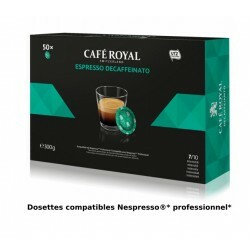 Café Royal deca capsules compatible with Nespresso ® PRO machines. Decaffeinato is an espresso capsule of sweet coffee 100% Arabica. This capsule is very digestible, the freshness of its acidity gives it a deliciously harmonious taste. With an intensity of 7/10 you can consume it throughout the day.